Yesterday I had a very frustrating day at the steakhouse and I was planning a whole long post about the honeymoon being over. Today was better and I was thinking I should write about how I need to not let other people’s moods effect my own. I am too sensitive to the ambience of my surroundings. If I am in a good mood and enjoying my work it shouldn’t really matter if the people around me are or not. I think it is a spiritual maturity thing, and I would like to work on it. But now that I am home all I want to write about is my dinner. 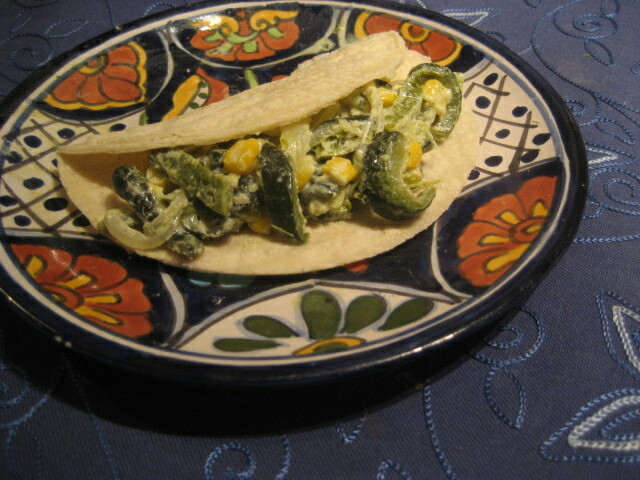 The recipe is very simple, Poblano peppers, onions, corn, cream and a bit of cheese. I used Chihuahua cheese. The main reason I had hesitated to make them earlier is the first step. When we made Chile Rellenos at our restaurant we would put the chiles in the fryer for a few minutes and then sweat them under plastic so the skin could easily be rubbed off. In Mexico I saw them put directly in the flame of gas stoves. Neither of those options are available in my house. Earlier in the week I had been craving them so much I had considered taking a few to the steakhouse and seeing if I could manage to put them in the fryer there without anyone getting upset, but of course I thought better of it. However one of the recipes I looked at this morning had a solution: broiling. I put the poblanos on a cookie sheet right under the brolier and let them get to the point that one was trying to catch fire then turned them and burnt the other side. After 15 minutes sweating under some plastic wrap the skin came off easily in all but one spot on one of the five. Deseeding them took almost no time at all. It’s funny that for so many years I didn’t cook much mainly because it seemed too time consuming and complicated. (My family would tell you this was because I was lazy. Whatever.) But now that I am used to the work of a restaurant kitchen when I decide to make something at home I am pleasantly surprised at just how quick and easy it can be. Skinning and deseeding 5 poblanos is a breeze when one is used to doing batches of 30 or more. On a day like Monday when I am on my feet for ten hours straight the last thing I want to do is come home and cook something. But on my days off and days like today when I only worked a seven hour shift it is totally worth it to make exactly the food I am craving. Next I want to see if I can make some crock pot barbeque and then I want to further explore traditional Mexican guisados. I can’t believe I lived in Mexico so close to so many good cooks and never bothered to learn their recipes. If I ever manage to get back down there I will pay more attention.